SanghaSeva: What you put into your mouth is as important as what comes out of it. What happens to such things intended to preserve, improve or enhance our food when they get into our soft organic bodies? Do they improve and enhance us? Unsurprisingly the quick answer to the second question is no. Although all the additives put into our food have been passed by food standards agencies as acceptable in the quantities that they appear, they have a magnified effect over time. The logical repercussion of adding small amounts of chemicals regularly is that, depending on the time it takes for them to pass through, they add up to a larger dose. Many additives have been proven unsafe in large quantities, aspartame (the sweetener) produces formaldehyde, butylated hydroxytoluene (BHT) (popular preservative) cause stomach and liver tumors, and pesticides can cause cancer. How do we know this? We served it to animals at high doses, lucky animals. The other day at a cafe someone from the next table ordered a mushroom burger, the waiter asked if they wanted veg-mushroom or chicken-mushroom, they replied “Chicken is also good.” That phrase “chicken is also good” has somehow stuck in my mind. Here in India the situation for that chicken to be good is inconceivable in every way I can think of. Passing through the market place one sees stacks of cages so crammed with chickens that their white feathers are pushing through the wire netting. 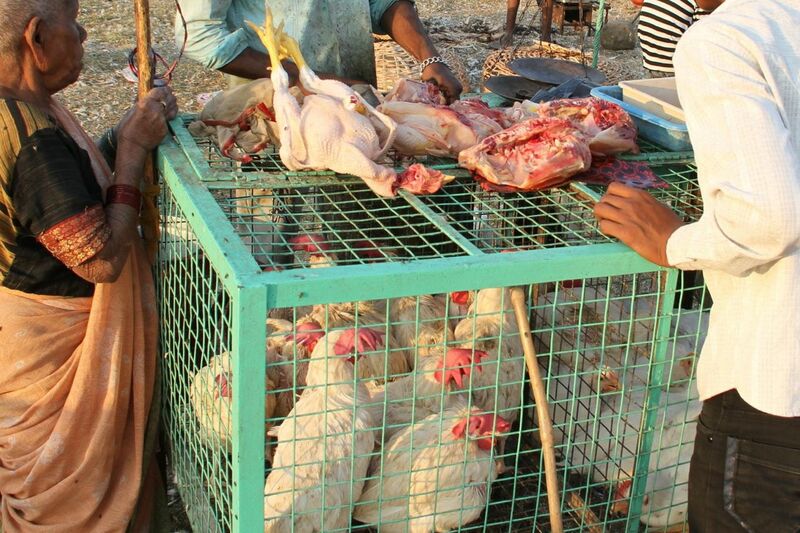 When someone buys some chicken meat a live chicken is pulled from the cage by its feet and its head is chopped off in sight of its siblings. 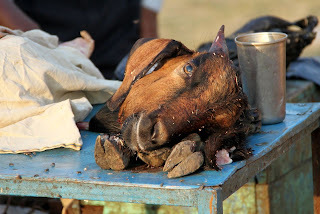 As I have mentioned before I am equal parts shocked and thankful to India for not hiding away the realities of our daily life, for to see the ending of an innocent animals life I am certain that I will not partake in eating them. Looking at the environmental impact of livestock (keeping animals for food production) is actually astoundingly shocking. It comes down to a very simple dictum; meat is unsustainable. This is nowhere near as catchy as Morrissey’s offering; Meat is Murder. Livestock production is a major cause of a long list of environmental problems including global warming, land degradation, air and water pollution and loss of biodiversity. It is responsible for 18% of green house gas emissions and 37% of anthropogenic methane, both of which are helping to change the climate of the planet. Over one quarter of the earth’s land is used for grazing, and one third of all arable (farmed) land is used for feeding livestock. 70% of previously forested amazon is now used for grazing. Keeping animals at the scale we do pushes wild animals into ever shrinking spaces of the planet. The wide-reaching presence of human’s and their animals makes it the single largest source of water pollutants. These come from animal waste, medicines, (hormones and antibiotics), chemicals from tanneries, and pesticides and fertilisers from feed crops entering the water systems. It is important to note that eating meat is only one way of supporting this devastation, drinking milk is perhaps equal to it. This summer in the UK (2011) there was a proposed cull on badgers, 1,000s of badgers were planned to be shot by marksmen in the fields where they live and roam. The reason for this was that badgers are carriers of the bovine affecting tuberculosis (TB), if a cow contracts TB then their milk will not be sellable and they will often be killed. This is a terrible (financial) loss to dairy farmers and some farmers therefore preferred to have the badgers killed as a preventative. The planned badger cull was dropped as it did not have one supportive reason to take place; more badgers are killed on the roads than would be impacted by this labour intensive cull; the likelihood of killing an infected badger was poor; plus if a sett of healthy badgers were wiped out then a TB infected family might move into the area. But by the time the decision to abandon this had taken place I had decided to become vegan. The assassination of these magnificent creatures was the final straw. I would like to mention some of the other straws. When I lived on a Kibbutz my partner and I built a mud house on the outskirts of the community, we had a beautiful view of the Jordanian mountains and the sounds of the dairy. Mostly this was the clanking of metal and machinery moving around, for a dairy is an industry more that a pastoral event. But the hardest sound of all was that of a young calf and its mother calling to each other. The calf would already have been moved to its small stall (1m x 2m) where if it was male it would live until slaughter. The mother was again producing milk so was among the productive cows. They could not see each other but they could hear each other and called for hours and hours, it was so painful, it hurts to remember it. Cows in particular are giving large amounts of chemicals to allow their bodies to produce insane quantities of milk, some of this remains in the milk (fear-monger moment), but to me it simply feels wrong to force this on another creature of the earth. A further consideration is in the foreshortening of the life span of a dairy cow, from a life expectancy of 20 years it is shortened to only 4. (Source en.wikipedia.org, www.factoryfarming.org.uk) Turn away now if you want to avoid the really ugly bit where the self-righteous vegan makes a cheap shot: We are the only species that drinks the baby food of another animal, and without wishing to cause insult to cows, it’s food to help the development of a large-bodied low-intelligent and somewhat docile creature. If that’s your ambition in life, so be it. It’s OK you can open your eyes again now. Is an animal free diet healthy? That is of course a natural concern, and some terribly unhealthy looking vegans come quickly to come to mind, yet many people live happy healthy lives without consuming animal derived products. Is protein actually that hard to find? The simple answer is no, there is enough protein in a normal balanced diet that consists of natural food. As in food that grew in a field not a factory. Good sources of protein are whole grains, nuts and seeds, soya beans, and the food with the highest percentage of protein is not meat or dairy but a blue-green algae called Spirulina. Calcium and Iron are also freely available through tofu, whole-grain bread, seeds and pulses. A balanced healthy diet is possible without a feeling of giving up anything. Nature quite clearly makes food that is indigestible look indigestible, I feel we shouldn’t be trying to fool each other. Surely a diet without synthetic or chemical additives will be easier to digest and will be guaranteed to be fresh. I feel it’s ethically and environmentally unsupportable to use animals as part of our diets. If you feel otherwise please add your view in the comments. Personally, I feel a lot healthier on a vegan diet, although I have been following it only since the summer of 2011 I feel my energy is clearer and more accessible. I have also been vegetarian for well over a decade and feel that this is a good diet for me, I feel (and look) fit and healthy with a lot of vitality. Feel free to add your views below.